"A fun and crunchy coating made with cornflakes, sesame seeds, and Parmesan cheese." 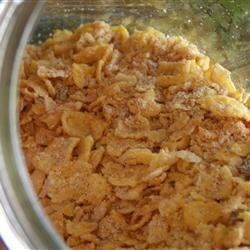 Combine cornflakes, Parmesan cheese, sesame seeds, paprika, and oregano in a bowl. Cover and refrigerate for up to 4 months. Dip chicken pieces in milk, then roll in about 1 1/4 cups coating mix. Place in baking pan. Bake in preheated oven until no longer pink at the bone and juices run clear, about 45 to 50 minutes. An instant-read thermometer inserted near the bone should read 165 degrees F (74 degrees C). What can I say - this is tasty and crunchy & easy too. I made this for Faceless Frenzy July 2012 - it didn't have a review or a picture. I will use this again for sure. FANTASTIC!! Very easy to do and incredibly flavorful. I would add a little crushed nuts in the cornflake mix. No changes....great to have on hand. I use this for fish as well. Normally I used bread crumbs, but the cornflakes give it a crunchier coating. Thanks for sharing!